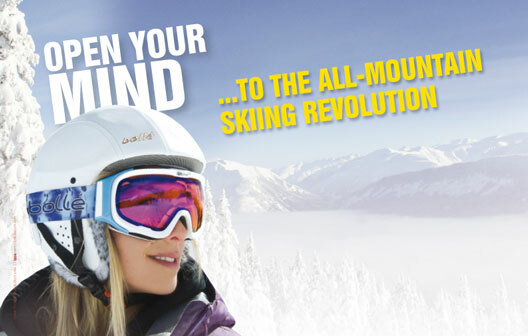 Open Your Mind to the All-Mountain Skiing Revolution! FOR DECADES, SKIING PERFECT PARALLELS DOWN ANYTHING WAS EVERY SKIER’S DREAM… BUT ONLY A SELECT FEW EVER REALISED IT. “Despite nearly ten years since the short carving skis revolution, many skiers are still using out-dated skiing techniques designed for the old, long ‘pencil’ skis era – techniques from skiing’s equivalent ‘dark ages’ – before we knew what we were really supposed to be doing. These past techniques are fine if you’re content skiing (ever busier) marked pistes, from one mountain restaurant to another. 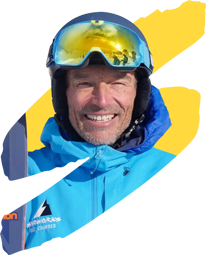 But if you want to ski efficiently, anywhere at anytime, maximising your potential, the time has come to bring your skiing into the 21st century and learn ‘all-mountain skills’ for ‘all-mountain skis’!! IT’S TIME TO GO ALL-MOUNTAIN! If a voice in your head is still telling you to, for example: ‘face downhill, plant your pole, stand up and sink down’, or when off-piste: ‘weight your skis evenly, bounce up and down and get a rhythm’, then you are using early ‘movement-pattern techniques’, and probably just ‘getting by’, missing out on much, much more than you realise. But that’s ok… it’s not your fault! These techniques have their roots in instruction methodology designed for less dynamic, ‘closed environment’ sports, such as swimming and athletics, for example. With the best intentions, these same teaching principles were applied to skiing, but without the knowledge of the mountain environment or the physics of ski against snow, or slush, or powder, or ice, or crud, or variable terrain… or at varying speeds etc, etc! Today, we now have this knowledge, this experience… and at Snoworks we’ve distilled it into a skills-based teaching philosophy, proven extensively to knock the old movement-pattern techniques ‘right off the mountain’! Rather than teach you any ‘techniques’, we teach an extensive, simple-to-follow, toolbox of skills instead, designed to take you and your skis into all terrains, down all slopes and – through our iSKI courses programme – pretty much anywhere on the mountain! It’s like switching from two-wheel to all-wheel drive! Join the All-Mountain Skiing Revolution starting on an iSKI course – check out dates and prices HERE or call us 0844 543 0503 for availability and more details.